Difference between revisions of "Monk"
Primary Attack: A Melee Physical Slash Attack dealing damage. Secondary Attack: A Ranged Magical Projectile Attack dealing damage. 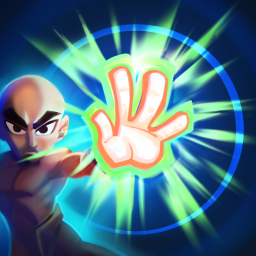 Lore: As a student of martial arts, the Monk thrives in combat, commanding the ebb and flow of the battlefield. 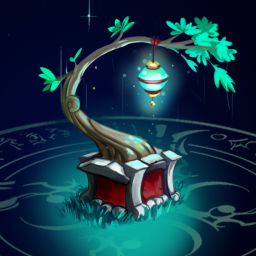 He supports his allies with radiant auras of Chi energy that boost the potency of defenses, electrocutes careless enemies, and heals fellow heroes. No hero deck is complete without his wisdom. 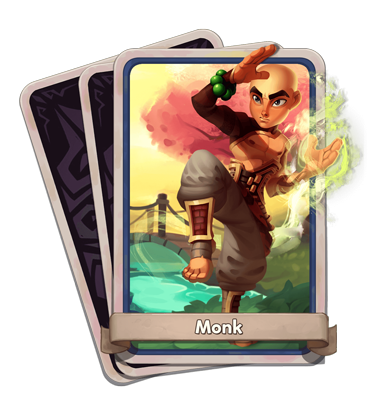 The Monk is a hybrid hero with both melee and ranged attacks. Melee Primary Attack deals Physical Damage, while ranged Secondary Attack deals Magical Damage. 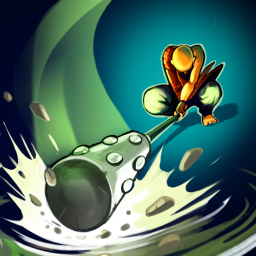 Pole Smash: The Monk slams his weapon into the ground, dealing Crushing Physical Damage to nearby enemies and knocking them into the air. 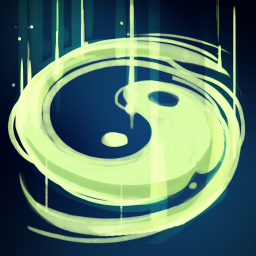 Chi Blast: The Monk sends forth a gust of Chi energy in a piercing line, dealing Magical Damage and knocking enemies backwards. Heroic Wave: The Monk emits a wave of stabilizing energy that Heals all nearby Heroes and increases their Hero Power for a time. Template:Poisonous Stacks (L) Charged Primary Sphere 1 : 15% chance for a primary attack to instead fire a fully-charged secondary attack. 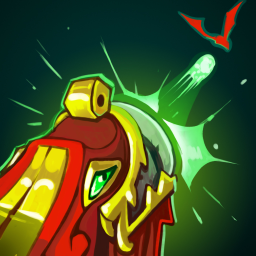 Drain Aura Boost Aura damages enemies for X. Tidal Wave Chip Heroic Wave deals X damage to nearby enemies. Stunning Wave Chip Heroic Wave stuns enemies for X seconds. Glaive of the Storms StormRider Ride a cloud that changes your attacks to lightning dealing X Ability Power as Storm Damage for 15s. Enemies under get drenched and are hit for X% of Ability Power as Storm Damage every 2s. North Pole Pole Launcher Secondary Attacks fire additional North Poles that deal X% Hero Damage as Frost Damage, pierces 2 enemies and slows them by 40% for X seconds. Sky Dragon's Fury Sky Dragon's Fury Secondary attacks spawn a lightning ball dealing x% Ability Power as Storm Damage 2.5 times a second for y seconds. Ocurs every 8 seconds.